Opinion: The Doctor And 'The Boy In The Bubble' In his essay this week, NPR's Scott Simon remembers William T. Shearer, who died this week at the age of 81. He was the doctor of "The Boy In The Bubble." David Vetter plays in the enclosed plastic environment that he had to stay in to survive. As 12-year-old David Vetter was about to die at Texas Children's Hospital in 1984, he gave a last wink to his doctor, William T. Shearer. His wife told us Dr. Shearer carried that moment through the rest of his life. Dr. Shearer, a professor of pediatrics at Baylor College of Medicine, died this week at the age of 81. David Vetter had been born with severe combined immunodeficiency, a rare disease that could have made it fatal for him to be touched, held, kissed by his parents or even take a breath of fresh air. Doctors devised a sterile clear plastic pouch to keep David alive until medical science could come up with ... something else. 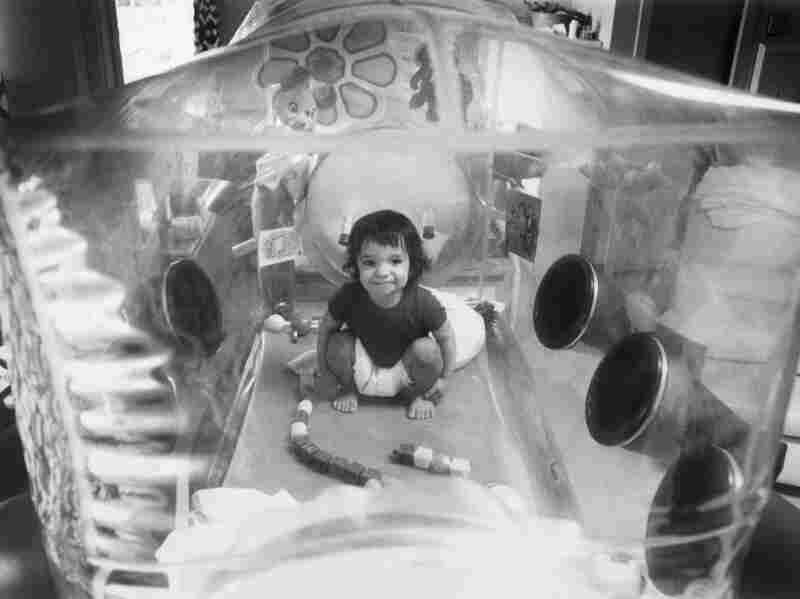 David Vetter became "The Boy in the Bubble." As he grew, it was a joy to see occasional photos of him smiling, playing, and so manifestly alive. It was also heartbreaking to see a smiling little boy who had to live in a bubble, and wonder how long he could, or even should, live that way. NASA engineers constructed a spacesuit for David when he was 6 that enabled him to walk around his family's house and even play catch with his sister, Katherine. But psychologists who worked with him said David was growing bitter about the way he had to live in a bubble. "We all knew the day would come when a decision would have to be made: in or out," Dr. Shearer recollected for a New York Times video in 2015. When David was 12, Dr. Shearer and his team used a new technique for a bone marrow transplant from his sister. But there turned out to be a dormant virus in Katherine's marrow; the transplant didn't work. For the first time since he was born, David was freed from his bubble, to be kissed by his mother, to feel the air of the world on his face and to die with that last wink. Dr. Shearer never really let go of David Vetter. He used lessons from his care to guide him as he focused on the new epidemic of HIV/AIDS in children. And today, early screening means many children can have a bone marrow transplant before they're even born. "What we learned from David is a textbook," he told the Houston Chronicle last year. "A textbook that he wrote with his life, and that we are still learning from." Lynn des Prez, Dr. Shearer' wife, told us this week that they only traveled to medical conferences and that he worked seven days a week. But he also had three marriages and six children, five of whom were adopted. And, she says, he kept David Vetter's wink in his heart. "I like to think," she told us, "that he has a friend up there, to show him around."